WASHINGTON (Oct. 09, 2008) -- Despite concerns about a balance between what it is being asked to do and what it can indefinitely sustain, the Army remains strong, said former Secretary of State Madeleine K. Albright. "The Army remains a mighty engine blessed by quality leaders and high morale," she said during the closing dinner, Oct. 9, at the 2008 Association of the United States Army Annual Meeting and Exposition. "But even the mightiest engine needs maintenance from time to time." Nicholas D. Chabraja, chairman of the AUSA council of trustees; the Honorable Madeleine K. Albright, former United States Secretary of State; and Gen. (ret.) Gordon R. Sullivan, USAA president and chief operating officer, were on stage at the closing dinner, Oct. 9, at the 2008 Association of the United States Army Annual Meeting and Exposition. Sullivan presented Albright with the George Catlett Marshall Medal during the dinner. Albright said the incoming president must take into account the needs of the Army when considering how to move forward in Iraq and how to build a game plan for Afghanistan. "These countries are difficult places to fight because the enemy wears no uniform and the social and political landscape is treacherous," she said. "The result has been a roller coaster with victory intertwined with setbacks. Throughout, our armed forces have performed magnificently." Albright said she had been concerned that Soldiers and their leaders were worn out from the fight, but found otherwise. "I was told that younger Soldiers are full of enthusiasm and anxious to succeed in their mission, proud of their jobs and expecting to win," she said, adding that senior officers as well shared that enthusiasm. Albright told Soldiers, civilians and foreign military officers at the dinner that while the United States needs the Navy to protect the seas and the Air Force to protect the air, it is becoming more apparent that the kind of warfighter that will be needed in the future will be the terrestrial, land-based forces made up of Soldiers, Marines and special forces. "The world is constantly changing and the Army has changed with it," Albright said as she closed her address. "What matters even more is what has not changed, your professionalism, your sense of honor, commitment to duty, spirit, and love for the United Stats of America. You are without question the strength of our nation." 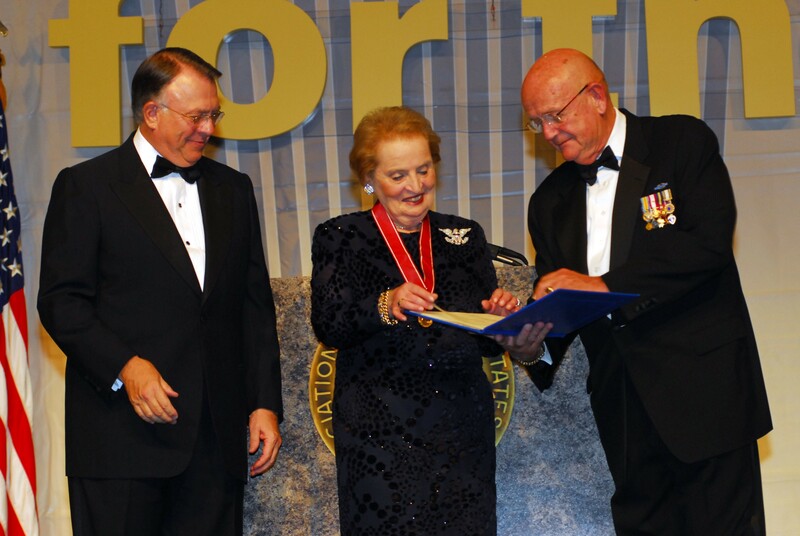 During the dinner, Albright was honored by AUSA as recipient of the George Catlett Marshall Medal. The medal recognized her more than 30 years of public service, her contributions to national security, and her efforts to expand and modernize NATO. "She dedicated her career to promoting American interests and values across the world," the award citation read. "In her role as a trusted presidential advisor, her contributions to national security dialogue and her stance in building strategic alliances has shaped America's foreign policy." Albright served as secretary of state from January 1997 to January 2001. Today she serves as a professor at Georgetown University in Washington, D.C.